ISD Solutions Single Envelope Construction Browns 13Energy managers face many challenges in keeping food storage costs down. At a time when utility costs are rising, inefficient cold storage facilities will need to be replaced or upgraded. For cold stores, supermarket distribution and logistics companies, the energy-saving characteristics and reduced construction costs of insulation have never been so important. Refrigeration is expensive and legacy infrastructures must be managed in the most cost-effective way possible. Traditional cold storage warehouses effectively involve the construction of two buildings, one inside the other. The resulting void between the envelope and the internal cold store roof may require fire prevention, heating/cooling and air-handling, all of which add to the capital investment. A traditional build can be time-consuming to construct and not particularly sustainable or thermally efficient. A whole new generation of energy-efficient warehouses is being constructed using state-of-the-art insulation materials and single envelope construction. Single envelope composite panel construction is fast outpacing traditional building methods in warehouse and cold store developments. The air-tight thermally-efficient building skin can be constructed around 20% faster than traditional builds and significantly reduces the need for secondary steelwork. Single envelope warehouses and cold stores can be constructed around 20% faster than traditional builds when using cold store specification composite roof and wall panels. The inherent strength and spanning characteristics of these modern composite panels significantly reduce the requirement for secondary steelwork, which represents a real cost saving. Apart from requiring lower capital investment at the outset, a single envelope cold storage facility requires an estimated 30% fewer raw materials. It can also deliver significantly lower long-term running costs than a traditional build. This is due to increased thermal efficiency and air tightness of the single envelope, which minimises the need to run duplicate services for a ‘building within a building’. Another aspect of build efficiency is a high bay design resulting in a much smaller footprint which can reduce land requirements by up to 4-5 times. All of this is completely changing conventional warehouse design and bringing with it significant cost and energy savings to developers and operators alike. One of the UK’s most energy-efficient cold storage warehouse solutions is located near Boston in Lincolnshire. It was constructed for Turners (Soham), a leading temperature controlled storage and distribution company. Turners wanted the most energy-efficient warehouse possible. 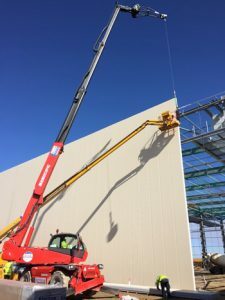 It commissioned a new warehouse extension on its existing site which featured a state-of-the-art insulated single envelope, designed and installed by composite panel specialist ISD Solutions. Turners’ 5,500m2 warehouse extension needed to provide capacity for 5,500 pallets, plus packaging space and loading docks, all chilled to 1°C. become a change-maker in the UK temperature controlled industry, spearheading the drive towards higher standards with the goal of achieving carbon-neutral status. Innovative solutions were required along with the ability of all stakeholders to work together cohesively in order to deliver the most energy-efficient warehouse possible. We know how important it is to think beyond insulation for optimal energy performance by looking holistically at warehouses or cold store projects. By bringing together smart design, experience, expert delivery and proven know-how, a cost reduction of up to 20% can be achieved1 whilst delivering a virtually airtight, high-energy performance building with low lifetime running costs. To start with, it was important for Turners’ energy manager to consider the correct level and type of insulation to achieve optimal thermal efficiency and whether fire protection was required. A careful assessment of the location, wind loadings and temperature cycles helped to ensure that the warehouse extension could safely accommodate normal shrinkage and expansion. Known as “thermal bowing” this is the physical distortion of wall panels as the exterior metal skin heats up in the sun, while the cold interior face contracts. With a potential temperature difference of 60 degrees on a hot summer’s day, how the composite insulation panels were fixed in place and the design of junctions, connections and fixings, was critical. The building needed to remain resilient and virtually airtight while accommodating up to 40mm shrinkage and expansion whilst minimising issues from frost and moisture in refrigerated storage areas. This was the first UK chilled distribution warehouse to use pioneering new panels to form the weathered external skin of the building. This skin incorporated Kingspan’s latest IPN-QuadCore technology, a new insulated panel core which delivers a thermal improvement of up to 20% over standard PIR insulated panels and was backed by the industry’s first 40 years thermal and structural guarantee. FJB Systems calculated that the new panels alone would reduce heat loss through the fabric of the external envelope by as much as 50kW. The thermal qualities of these metal-faced composite panels keep temperatures constant and virtually airtight, regulating heat loss and gains to reduce the building’s energy consumption. With air leakage regularly achieved at below 0.1m3 per hour per m2 at a pressure of 50 pascals, the building far exceeded 0.5m3 design guidelines set by the International Association for Cold Storage Construction. The project was shortlisted in the 2016 RAC Cooling Awards in the Environmental Collaboration category. With more cold store specification single envelope projects already underway, there is growing interest among energy managers in these innovative and sophisticated, thermally-efficient, low-carbon warehousing, cold storage and retail distribution storage solutions that offer a smaller physical footprint, fewer raw materials used in construction, and higher levels of thermal efficiency.